What’s the Average Cost of Propane Gas in North Texas? What’s the Difference Between Propane and Natural Gas? Propane Basics: Where Can I Fill a Propane Tank in Texas? As we all prepare for the spring and firing up our barbecue pits, our Dallas TX propane gas experts at Northwest Propane are hoping you are choosing propane grills over charcoal grills. From an operational standpoint, both have their advantages, but when it comes to cleanliness, propane’s odorless, colorless gas is a favorite compared to charcoal briquettes and ash that can be extremely messy and more difficult to clean after cooking. 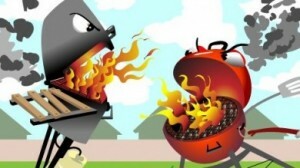 From a taste perspective, charcoal tends to add a distinct smoky flavor, whereas propane offers more of a natural taste. Propane grills, in addition, are faster cookers, which gives them an edge in the convenience category. Hank Hill doesn’t work for us, but we definitely endorse propane grills over charcoal grills as he would. Let our Dallas TX propane gas experts assist you with more comparisons and contrasts between propane grills and charcoal grills. For additional information, call our Dallas propane dealers today, or visit us online.